Justin Robinson set a career-high in points and broke two school records in No. 8/10 Virginia Tech’s 78-56 rout of Syracuse in Cassell Coliseum on Saturday night. The Hokies, who led by as many as 25 points, improved to 16-3 overall and 5-2 in the ACC with the win. The Orange, who never led, dropped to 14-6 overall and 5-2 in league play. Syracuse came into this game winners of their last three games, including a 95-91 victory against Duke in Cameron Indoor Stadium. They could never get going against a stifling Tech defense, which held the Orange to a 20-of-55 (36.4%) shooting night, including a 9-of-28 (32.1%) mark from three-point range. The Hokies also forced 14 turnovers. Buzz Williams was pleased with his team’s performance on the defensive end. That terrific defensive effort wasn’t the story of the night, though. Senior guard Justin Robinson stole the show, netting a career-high 35 points while also breaking two school records. Robinson was 9-of-14 from three-point range, and his nine three-pointers in a single game is a new school record. The big one, however, is the Virginia Tech career assist record, which Robinson now owns. With 2:37 remaining in the blowout, Robinson found freshman Isaiah Wilkins under the basket for an easy layup. That marked assist No. 548 in Robinson’s outstanding career, pushing him past Bimbo Coles as Virginia Tech’s all-time assists leader. Buzz Williams called a timeout less than a minute later and removed Robinson from the game, who got a standing ovation from the crowd in Cassell Coliseum after his records were announced. When Robinson committed to Virginia Tech and Buzz Williams, he committed to a program that had finished in last place in the ACC for three years in a row. Four years later, he’s the school’s all-time assists leader, and he’s on the brink of leading Virginia Tech to the NCAA Tournament for the third year in a row for the first time in school history. Another one of that core group was Ahmed Hill, who originally committed to Buzz Williams at Marquette. He followed Williams to Blacksburg and has had a big role in the turnaround of the program. Hill had 16 points and six rebounds in Saturday night’s win, and was a human highlight reel of open court dunks. Like everyone else, Hill was impressed with Robinson’s performance on Saturday, as well as his entire career. The Hokies remain unbeaten at home with a perfect 11-0 record. They are one of two ACC teams who are unbeaten at home, with UVA being the other. With one ACC victory on the road against Georgia Tech, the Hokies are now plus-one when it comes to road wins and home losses. They’ll have a chance to go to plus-two, or even plus-three, with their next two games coming on the road. The Hokies will face the Hurricanes (9-9, 1-5) on Wednesday night. Tipoff is scheduled for 7pm, and the game will be televised nationally by ESPN2. The Hokies entered the game ranked 10th in the AP poll and 8th in the USA Today Coaches poll. Justin Robinson now has 548 career assists, setting a new school record. He passed Malcolm Delaney and Bimbo Coles into first place in tonight’s game. Robinson had eight assists in tonight’s game. Justin Robinson scored a career-high 35 points. This is his 13th game in double figures this season and his second career 30-plus point game. The 35 points are tied for second for the most points in an ACC game by a Hokie, trailing only Malcolm Delaney’s 37 points against Clemson on Jan. 29, 2009. 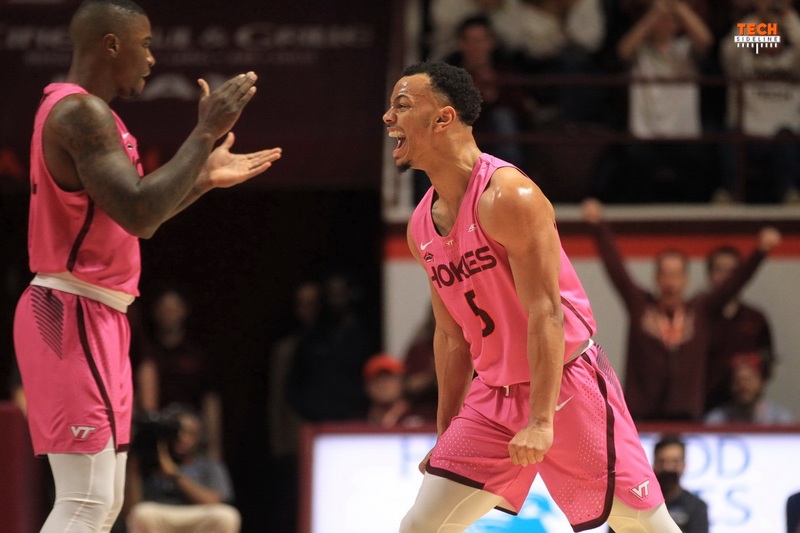 Justin Robinson set a new Virginia Tech record with nine three-point field goals in tonight’s game, breaking the old mark held by teammate Ty Outlaw, set in a win over Miami two seasons ago. The nine three-pointers is tied for fourth-best in ACC history. Ahmed Hill scored 16 points. This is his 13th game in double figures this season. Nickeil Alexander-Walker dished out a career-high eight assists in the win. The 22-point margin of victory is the largest for the Hokies against the Orange. The Hokies are now 4-9 all-time against Syracuse. The Hokies are now 11-0 at home this season, 4-0 in ACC games. Awesome effort and a Great win! This team is really fun to watching when they are firing on all or cylinders. I am digging the defensive effort. I missed the reason for the pink uniforms. Help? Pink is usually for breast cancer awareness. January is coaches against cancer month. You will notice all of the teams at least once this month wear pink at home. Also something was said about pink sneakers and I did not catch that part. Thanks – October is the official BC month but I had not remembered the coaches focus. I guess it also gives basketball a chance to get involved. This team is too short.They have no depth. They are all heart and hustle! I don’t think that it true that the 22 point differential is the biggest between the two schools. I remember a game in the mid 70s when Syracuse came to Cassell ranked in the top 10. Hokies beaten by about 40 points. Just sayin. That wouldn’t be a margin of “victory” for the Hokies then. Would it? I recall seeing a stat on ESPN (it was on the screen during the UK game) that said we were 1-9 in our last 10 against Syracuse. I am not sure how that impacts the win loss stat in this article. I’m not a fact checker. That’s how you sell out the Cassell regularly. Just win baby, WIN! Tremendous effort. I loved how the team was especially unselfish. I was mesmerized by their efforts to move around the ball by passing it all over the place. Obviously something that would be more prominent against a strong zone team like ‘Cuse. It was the night to shine for #5 but it was still a team win. It was also exciting to see Cassell filled to the brims last night and hear their contributions to the game on TV. We are still Jekyll and Hyde at home/on the road so we better figure out how to exercise those demons during our next few games. Stronger demons = bad. Let’s exorcise them instead. Great ball movement most of the time. Making the right pass, seeing the court, quick sharp passes, leads to open shots. They looked really sharp. When 5 hits shots we are almost unbeatable. We didn’t need him tonight but NAW struggled offensively. Great assist total but 0-6 shooting and 5 TOs, looked like the GT game. Maybe they were doing something defensively on him. We passed really well out of the post position in the middle of the zone. Awesome game against a good team, something we hadn’t done in ACC play. Looking forward to seeing us find our groove on the road. Go Hokies! Walker had the toughest spot on the court, in the middle of the 2-3 zone for Cuse. That meant he was in more of a passing role than a shooting role. And the shots he did get were often highly contested from all around him. This! Naw is 6’5” playing a 7 footers role last night. TOTAL TEAM player😀. We will miss him dearly next season. Team player, fewer points than usual, but great contribution.